Sonic speeds back into action with new moves, new Colour Powers and six dangerous new opponents in Sonic Lost World, exclusively on Wii U and Nintendo 3DS. We sat down with SEGA's Global Sonic Brand Director, David Corless, to talk about the hedgehog's new adventure. Nintendo of Europe: Firstly, please introduce yourself and your work on Sonic to our readers. David Corless: I’m David Corless, and I’m the Global Sonic Brand Director. I work closely with the Sonic Team over in Japan, who create the games, and with them I help shape the sort of games we want to make. So I help with the overall planning for Sonic’s future, i.e. what games we’re going to make, when we should release them, and I also look at who is buying Sonic games and make sure we understand who that audience is. From a marketing side my team and I handle everything from creating the game trailers, pack art, websites through to TV adverts and so on. It’s a wide-ranging position! NoE: Is this a new position for you? DC: I’ve been in this post for four years now and I’ve been with SEGA for six. 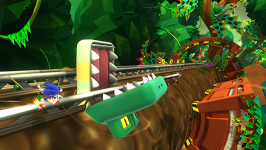 NoE: We’re here to talk about Sonic Lost World for Wii U and Nintendo 3DS. Can you give us a quick introduction to the games and the story? DC: First of all, it’s a brilliant game – it is one of the best Sonic games that I’ve worked on. The story sees Sonic come up against a new foe, the Deadly Six. Initially the Deadly Six were working with Dr Eggman but they decided to go it alone and try and take over the world by themselves. So this sees Sonic having to team up with Dr. Eggman and, along with using his all-new powers and moves, defeat the new threat. We’ve come up a lot of new things in the game, but we’ve also taken inspiration from past titles. The levels are new but they may seem familiar to fans in some respects, as do the enemy designs other than the Deadly Six. We also see the reintroduction of Colour Powers, and we’ve added new ones like Eagle and Asteroid that sit alongside some old favourites like Drill and Laser. In terms of Sonic’s new moves, he’s got what we’re calling the parkour system, so he can run on the side of walls, grab ledges and so on, which makes the game much more fluid and fun to play. Then there’s the reintroduction of the Spin Dash, a classic move. 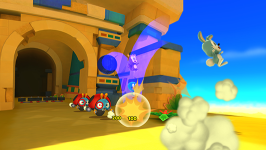 The team have also introduced different levels of speed for the first time that allow you to be a little bit more precise with your movement – which is really important in a platform game, but you also still have that magical burst of Sonic speed when needed. 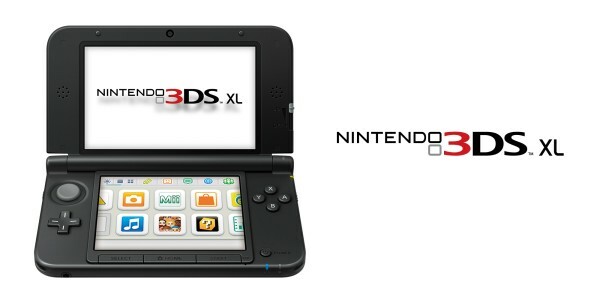 Both the Wii U version and the Nintendo 3DS version have their own unique features, and there is even a special Deadly Six Edition of the game with some new battles against the Deadly Six to take on. So a lot to talk about! We’re hoping there are many little touches that the core fans will notice and appreciate while new players will just find it a really exciting new game. NoE: So, story-wise, Sonic and Dr. Eggman work together to take on the Deadly Six…? 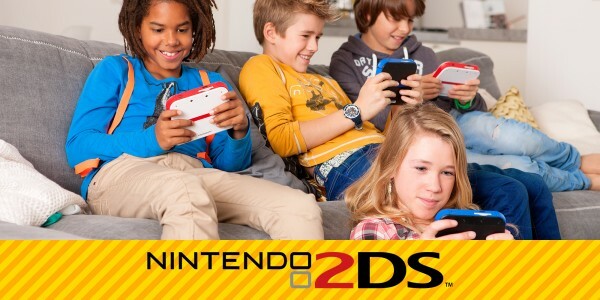 NoE: So can you tell us a bit more about the Wii U experience? DC: Of course! First of all the Sonic Team have relished the challenge of working on a new platform and they loved working on Wii U – it gave them scope to come up with new and innovative ideas, which I feel shines through in the final game. 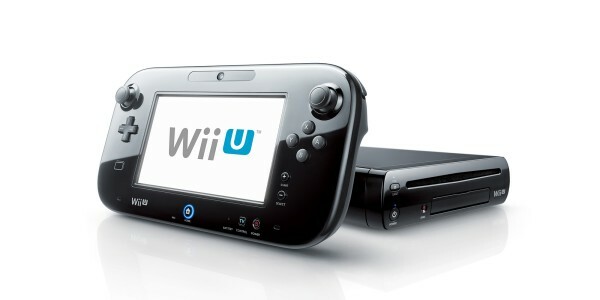 For instance, the team have used the Wii U GamePad in different ways to add to the game experience. The Colour Powers show this off really well as each of them uses the GamePad in a different and unique way – some use the touch screen, some use motion controls, for example. It’s great fun! Also, when you play in multiplayer mode, one player can use the big screen and the other the GamePad screen. 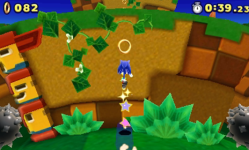 Having multiplayer in Sonic Lost World is something I think the fans will really enjoy. There’s co-op in the main game too, where a second player can drop radio-controlled vehicles created by Tails into the game to help out Sonic. And if someone wants to watch TV but you want to keep playing, you can switch the screen and play it solely on your GamePad. I think you can really see the quality and innovation that the Sonic Team has brought to this title. NoE: And the game uses Miiverse too, what can you tell us about that? DC: In Sonic Lost World you can take some of your Colour Powers, send them to Miiverse, and after a period of time you’ll get them back and they’re even more powerful. 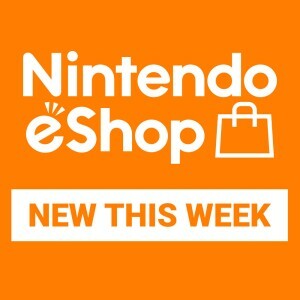 NoE: Moving on, tell us about the Nintendo 3DS version of the game. DC: We’ve really come from this perspective of wanting to make them feel like different experiences. Recent games have looked different from an aesthetic point of view but the games themselves were similar. With Sonic Lost World we’ve tried to do things differently: new levels, special stages, new and exclusive Colour Powers for Nintendo 3DS. You can also create RC Vehicles in Tails’ Lab which you can then push through to the Wii U version. This is also the first true 3D Sonic game on a handheld in terms of the way we’ve built the world, and it looks amazing. The game also has four-player multiplayer. Overall it’s a brilliant version. NoE: Can you tell us a bit more about the game’s very distinct art style? DC: The team’s aim was that whenever you see the game in a screenshot it always looks like a Sonic game – everything from the look of the environments to the colour palette used, the green of the tracks, the blue skies, everything. But even when it’s not a level inspired by a classic Sonic game, the design is what you’d expect a Sonic game to look like. And although it looks simpler in terms of the art style, technically it’s no less advanced and it’s actually still very detailed. If you zoom in on Sonic’s foot, it’s perfectly modelled and holds up. The graphical fidelity on Wii U is really exciting. But with the much bolder colours and design the game really does evoke that classic SEGA and Sonic feeling and that’s what we wanted. 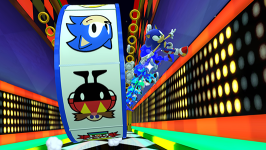 The Sonic Team has taken a lot of inspiration from the older games; from the enemies, bringing Spin Dash back and so on – so bringing the classic colour palette back was a similar decision the team made. NoE: What level of challenge are we looking at? 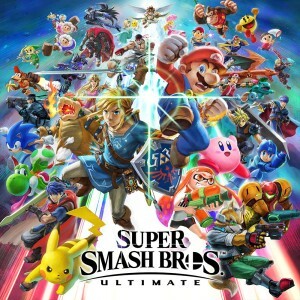 Is it only for more well-versed players or can newcomers get into it too? 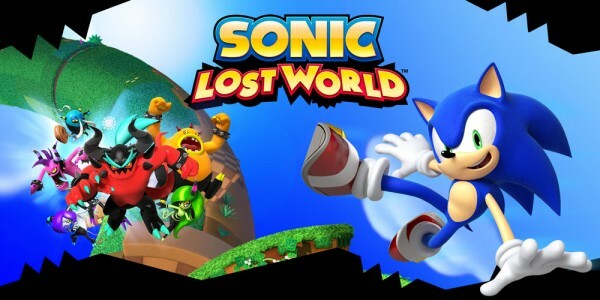 DC: Sonic Lost World is for everyone. I think someone who’s new to the world and to the game experience will love it just as much as a core fan. The user experience has been made more fluid because of the control mechanisms, some of the changes we’ve done there have really helped. In terms of the more core fan there are multiple ways to play through, you can do it as a speed run, try and find every Red Star Ring, or collect all the rings, so they’re going to get more out of it too. But it really is for everyone: the colours, the visuals, the fun Colour Powers, the nods to previous titles. So hopefully I’ll be proved right, that everyone will love it. NoE: What can you tell fans about the Deadly Six Edition for Wii U? DC: The Deadly Six Edition includes the exclusive downloadable content, known as the Nightmare DLC, and it comes wrapped in its own exclusive packaging. Basically Sonic’s worst nightmares come true – the Deadly Six appear in his dreams on massive monsters, and he has to fight them. But what’s really exciting for fans are the monsters are inspired by NiGHTS into Dreams… another classic Sonic Team game, so all the monsters are based on Nightmaren from that game! There are also environments inspired by the game, and a couple of sections where you’re running alongside NiGHTS. It’s all very cool. 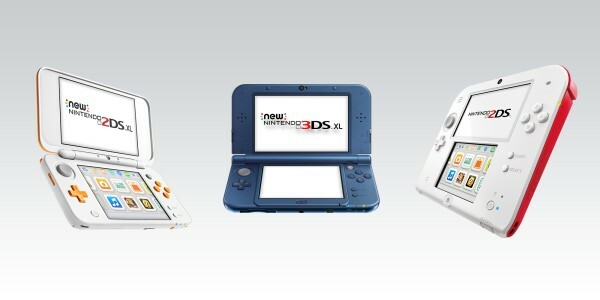 NoE: Did you encounter any surprises when developing for Wii U & Nintendo 3DS or did you encounter any funny stories? DC: The best thing about working on a big brand like Sonic, no matter if it’s the development team or marketing, is that it’s fun to work on one of the world’s most iconic video game characters, and it is a pleasure to do that. You sometimes forget about that until you’re walking down the street, and you see a kid in a Sonic t-shirt or playing one of your games on the train. If we’re enjoying what we’re doing and having fun, hopefully that comes through to the fans – and that goes for us as well as the Sonic Team. They enjoy their work, they’re hugely passionate and they love what they’re doing – they have a lot of fun over there, and it comes through in the game. It all stems from working on Sonic, so it’s part and parcel of the job. NoE: You mentioned at the start you help decide what sort of games you want to make – what sort of Sonic games do you want to make? DC: Well I wouldn’t want to take credit for the games that we create. That’s for the Sonic Team, they’re the creative guys, they come up with all the new ideas, I just help support them within that process, so I’d want them to answer that question! But there are many new directions we can go with Sonic – and not just in the gaming world. We’re growing and expanding Sonic and we have some brilliant ideas. NoE: What about a first-person shooter? DC: What, Call of Sonic? The Deadly Edition? (laughs) No, of course there are different directions we can take Sonic. The Sonic Racing series has been a huge success and I think those two titles have really shown what we can do with Sonic outside of platforming. You have to be careful though, you have to make sure you’re complementing the core Sonic experience and you’re staying true to the character. So no Call of Sonic, no…! Sonic Lost World launches for Wii U and Nintendo 3DS, both in shops and as downloadable versions from Nintendo eShop, from October 18th. Sonic Lost World Deadly Six Edition for Wii U is available for pre-order, or while stocks last.